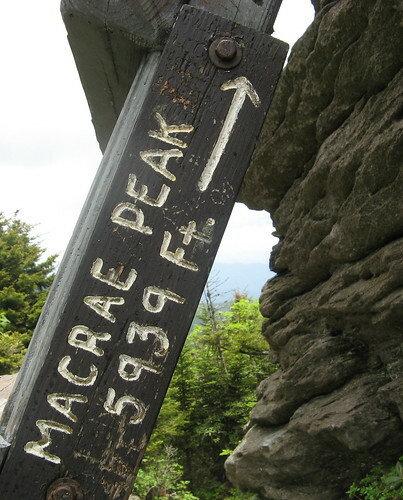 This is a great combo if you’re into contrasts: start out with a sane, scenic hike to the Mile High Swinging Bridge, then move on to the utterly crazy ridge route to Macc Peak. There’s a certain sanity to the .6-mile hike up to the bridge from the Black Rock parking area: the climb warms you up for the gale-force winds creating an eerie hum as they pass through the span. The insane part is the bridge itself: it serves no practical purpose beyond offering a shortcut to a rocky knob on the far side of an 80-foot-deep gorge. Of course the absurdity of an unnecessary bridge makes it an irresistible tourist stop. The first law of tourism: cash mistakenly placed in a tourist’s wallet must be handed over to its rightful owner, the tourist attraction developer. Second law: the tourist must feel good about the hand-over. 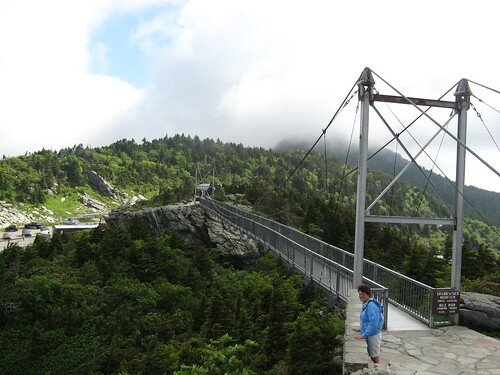 This brings us to the real utility of the Mile-High Swinging Bridge: It’s very cool. Cool to walk across, cool to take pictures of your sweetheart walking across, cool to stand under and take even more pictures, cool to listen to that never-ending hum. 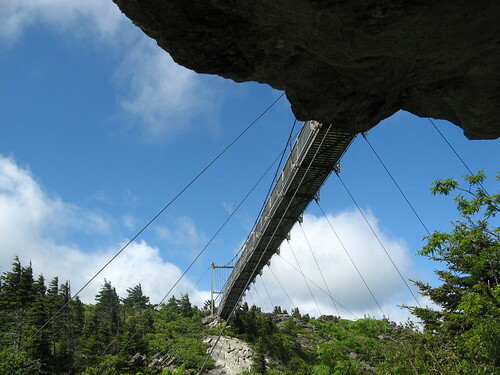 After a half-hour at the bridge, Grandfather Mountain’s $15 entry fee feels like Deal of the Decade. The 15-buck fee also encourages hikers — “frugal” is etched in our DNA — to find cheaper ways up the hill. The two free routes (Boy Scout Trail on the Blue Ridge Parkway and Profile Trail on the west side of the mountain) are just warm-ups for the main event: the three-mile obstacle course from the bridge to Callaway Peak, highest point on the mountain. How gnarly is this route? Last time I hiked to Callaway Peak, I averaged 1.3 mph in three miles with 2,100 feet of elevation gain. 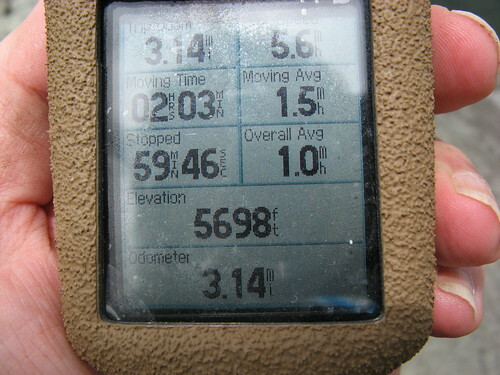 Yesterday I averaged 1 mph with 600 feet of ascent. That’s not an atypical pace: I met a park employee at Calloway Peak last month who told me she’d just spent three hours hiking there from the Swinging Bridge. She was not old and slow like me; she was young, thin and athletic, like the hikers who are always passing me like I’m standing still. What kind of trail slows everybody to a slug’s pace? Let’s let the pictures tell the story. 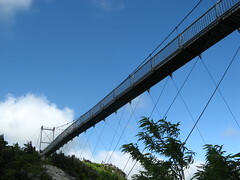 I’ll start with the warm-up hike to the bridge, then move on to the real fun. Here’s a look at the Bridge Trail, which starts across the road from the Black Rock parking lot. It’s not super steep, just enough to get your heart rate up. Here’s the bridge from the far side. Bridge Trail ends at the other end. A new visitors’ center is under construction over there; not sure when it’s supposed to open. Sometimes I can’t help noting the contrast between the natural and the mechanical. Folks gather on the rocky knob on the far side of the bridge. Grandfather Trail starts at the top parking lot across from the visitors’ center and goes out to Callaway Peak, but it has a “trail closed” sign. Obedient citizen that I am, I turned around and retraced my steps back down Bridge Trail to the Black Rock parking area. I’m glad I went this way, because I saw this cool view from beneath the bridge. However, I could have done a loop hike back to Black Rock if I had ignored that “trail closed” sign at the top parking lot. I’m guessing the park closed the trail to discourage hikers from parking up there, thus taking spaces away from paying customers of the new visitors center. Here’s a picture from that “closed” section of Grandfather Trail. 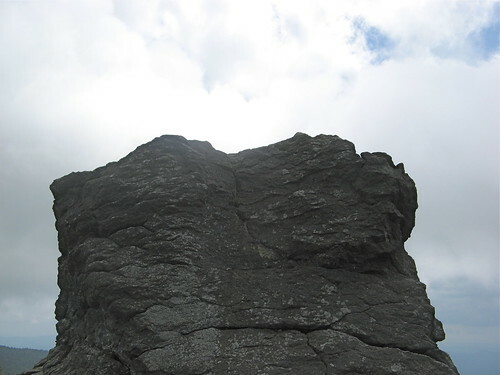 (Loop route from Black Rock parking area: Bridge Trail to the bridge; cross the parking lot to Grandfather Trail; take it to the Grandfather Trail Extension; turn right and return to Black Rock parking area). OK, on to MacRae Peak. 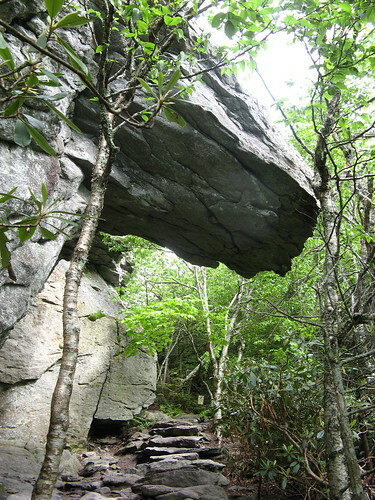 From Black Rock parking area, you take the Grandfather Trail Extension up to Grandfather Trail and hang a right. 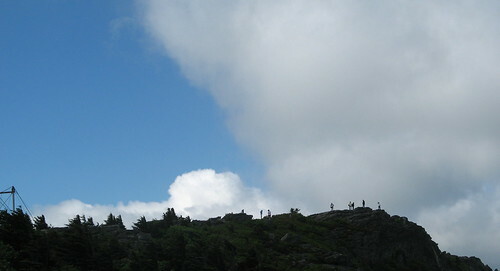 Follow the blue blazes all the way to the peak, descend to MacRae Gap, turn left on the yellow-blazed Underwood Trail, turn left at the Grandfather Trail Extension to get back to the Black Rock lot. Typing these instructions is the only easy part of this hike. 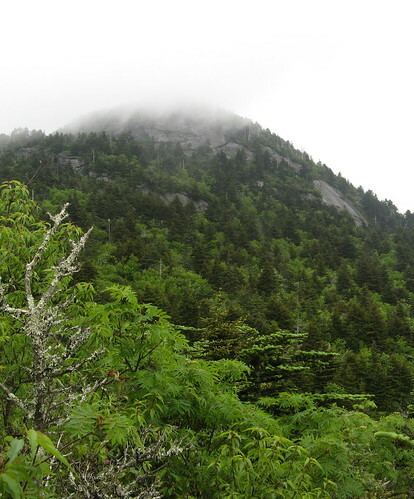 MacRae Peak, from Grandfather Trail. The hiking’s pretty basic till you reach the junction with the Underwood Trail. I turned right, staying on the blue-blazed Grandfather Trail. Two women who looked to be of collegiate age started up this trail ahead of me. Note if you’re at the cables: let one person at a time ascend/descend; otherwise two people tugging on the cable will make it hard for both to keep their grip. From here to the top it’s over 460 feet of climb in four-tenths of a mile. One of many ladders on the way up. These ladders are the most unnerving part — in a few places you see nothing but sky ahead of you; then you cling to a cable as you return to the trail, what there is of it. The cable sections are more physically challenging, but the angles feel a bit more forgiving. Never let ’em tell you there are no “rockies” in these mountains. Quick GPS check. Not quite to MacRae peak, but very close. If you look closely in the lower center of this shot you can see a small blue rectangle. Looks impassable from this distance, but there’s a path through there. 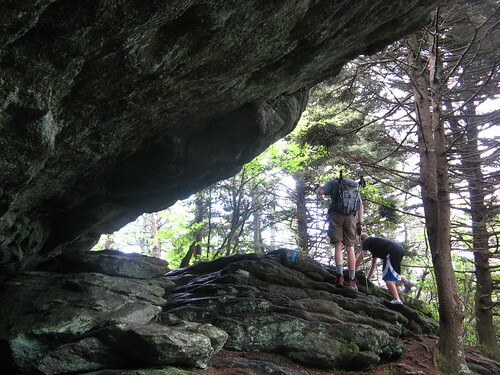 When you round a bend and see this huge chunk of rock, you’ve found the MacRae Peak summit. This ladder is the last ascent to the peak. Go up and check out the view, then come back down to resume the hike. That’s the Blue Ridge Parkway down there. From MacRae Peak there’s one more hairy cable descent, then a short walk to MacRae Gap. From here it’s 1.2 miles one way to Callaway Peak, or you can hang a left on the Underwood Trail and retrace your steps back to Black Rock. I had a sneaking suspicion there’d be even more craziness on the way to Callaway, so I took the shortest path back to the trailhead, via the Underwood Trail. Almost forgot to mention there are wildflowers blooming up here. 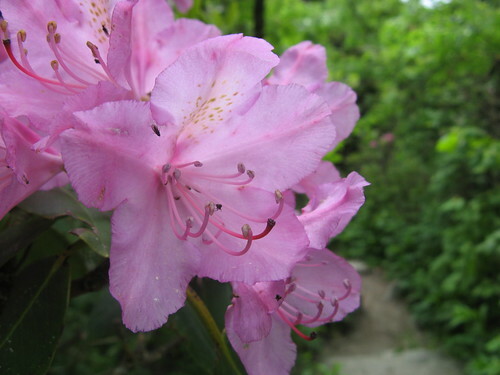 Indian legend has it that each blooming rhododendron represents the blood of warriors who died fighting other tribes for the right to rule these mountains. Mountain Laurel, I presume. 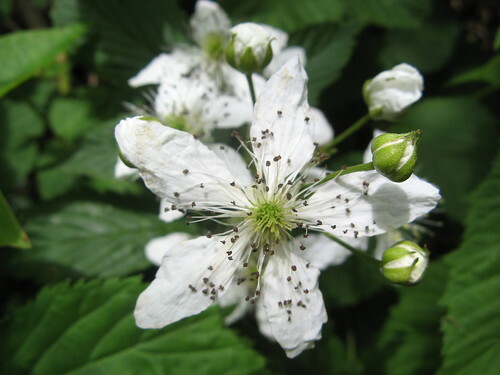 Oops, I’m told this is a wild blackberry bloom. One more look at the Blue Ridge from the Grandfather Trail Extension. 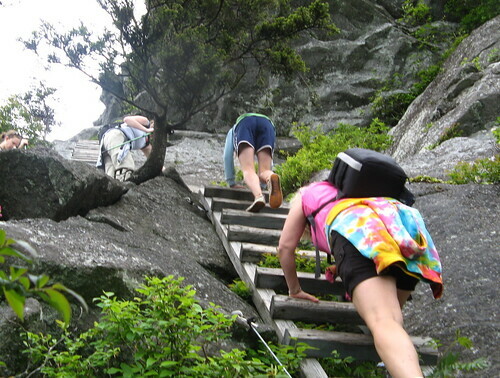 Closing thought on this hike: if you’re feeling frisky, leave the bridge for the tourists and head straight for Callaway Peak on Grandfather Trail. 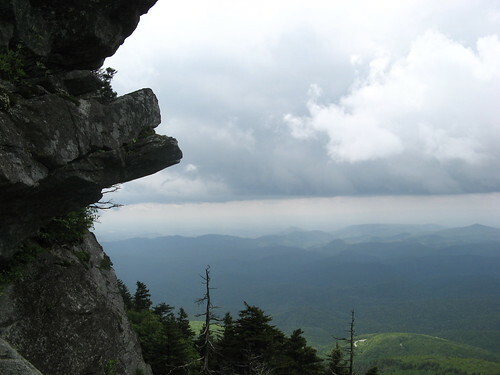 Take the Underwood Trail till it rejoins Grandfather, climb up to Calloway and follow the blue blazes all the way back. 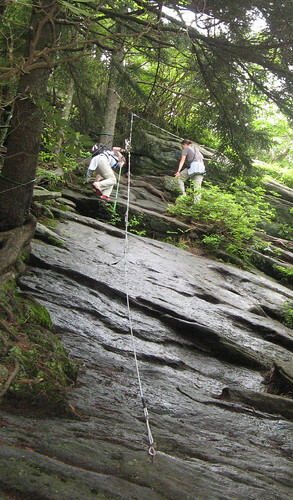 The descent from MacRae Peak will be, shall we say, exhilarating. Standard precaution: Weather can get ugly in a hurry in the Western Carolina high country. Always check the weather forecasts for nearby towns to make sure no storm systems are passing through. 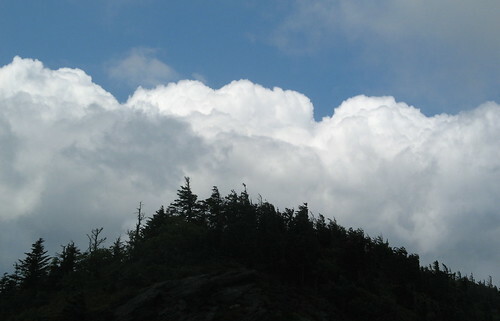 In summer, 90-plus heat in the valleys creates massive thunderheads that turn into lightning storms in the afternoon. You don’t want to be on this hill when that happens. Also: I hiked in ultralight trail-runners that really aren’t up to the task of protecting your feet from boulders filling the trail at extreme angles. I’m not convinced you need the deep-lug tread of heavy backpacking boots, but stiff-soled shoes with trail-ready traction and a firm footbox could save you a lot of pain. Guidebook author Randy Johnson’s Grandfather Mountain page. Love the views and this hike. I’ve done it solo quite a few times but my hiking buddy (my 5 year old) isn’t quite ready for something this rugged yet, I don’t believe. I’m always looking to hook up with experienced hikers and backpackers in the triad (I’m in Yadkinville), so let me know! I also just posted a recent trip report for the Pilot Mountain Mountain Trail, take a look at that and let me know if it’s useful! Shane: I checked out your blog — you’re off to a fine start. I suspect a 5-year-old would be physically capable of hiking the peaks at Grandfather – the real issue would be lack of judgment and experience. You’re lucky to have a little guy who likes to hike; so many can’t stand to be away from their video games for more than 15 minutes. I could definitely use some company on the long drives to trailheads — drop me a note at twoheeldrive@gmail.com if you want to get together. I’m fine w/having a 5-year-old along — we probably travel at about the same pace. Tom – super hike and write-up, as always! What do you consider a “long” drive to the trailhead? Two hours? Why, that wouldn’t even put you in Yuba or North Fork country here in the Land O Plenty! Yeah, two hours is a pretty good standard. Interestingly, the time to Great Smoky Mountains National Park from here is almost exactly the same as the time from the Bay Area to Yosemite Valley. I can’t say you would be crazy to take your 5yo, but it wouldn’t be my first choice. That is one heck of a hiker for sure – haven’t done it since I was about 12 — ohhh 16 years ago. But don’t kid yourself Tom, it’s hikes like this that keep you young! Ralph, are you saying that taking the 5yo is crazy, or the hike itself is? My hiking buddy and I move at his pace and his technical skill and agility are better than mine. His endurance and max pack weight are the only things holding him back and both of those will change as he gets more experience and muscle. I’d much rather be hiking with my boy and teaching him to love a challenge than letting television raise him! I was pretty amazed you hiked eight miles with him at Pilot Mountain — that’s like 20 when you factor in the difference in his stride from an adult’s. Yeah, he did really well. We took our time, he called the break times and when to stop and take pictures. The only time we had trouble was on our way back down. He wanted to pretty much hop downhill and I actually had to call breaks for my knee (had some damage repaired after a helo crash in baghdad and am taking it easy till the strength comes back). He would sit there with his water bottle and tap it like his momma does.. just waiting for the old man to be ready again! Crossing bridges, especially during a hike, really freaks me out! Especially when these are swinging bridges, I once retreated and went home, refusing to go on with the hike, just because we had to cross a swinging bridge. Well-written post and verryyyy nice photos, too. This looks like something to add to my list of adventures. Those photos were beautiful and the hike looks like a challenge. Thanks for sharing! Cutter: I didn’t try very hard to get that one right — I’ve identified mountain laurels before, I just forgot what they looked like. Thanks for the excellent post and pics. 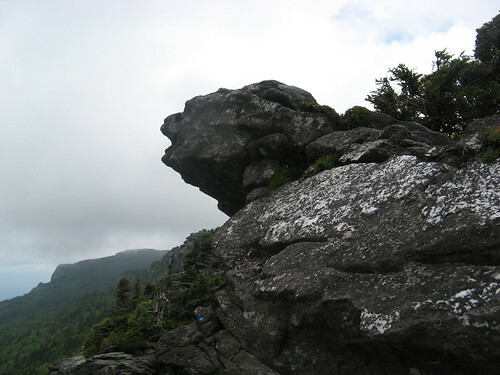 I have never been to Grandfather Mountain before, so I have a question if you’ll entertain it. Thanks a bunch. I’ll divulge a little bit in the chance that you or someone else will help me out– I’m looking for a relatively short hike up to a place with a nice view to pop the question to my girlfriend. 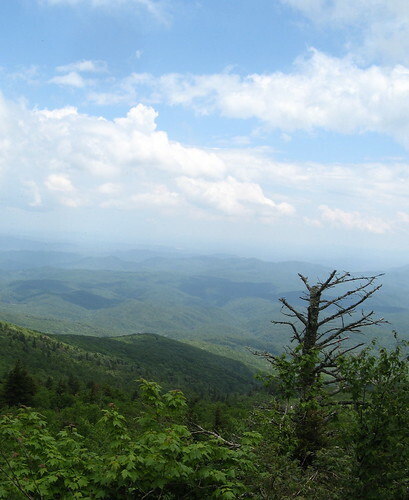 I’m looking at this and I’ve also seen Max Patch… any other suggestions? It will be mid to late July if that matters, and we’ll probably start around 8 or 9 am to try to avoid the high probability of afternoon storms. 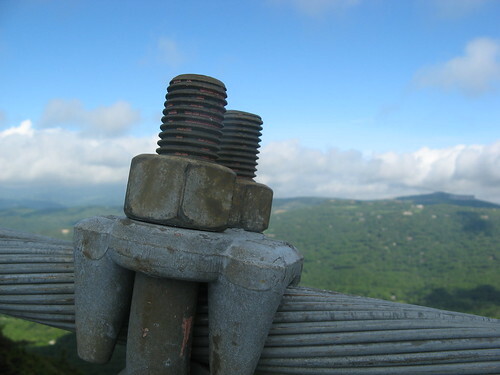 George: no climbing gear required on the cable, though there are some somewhat scary descents. 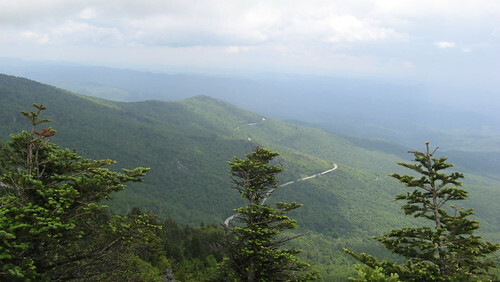 Tell you where I’d consider: Wiseman’s View at Linville Gorge. Only a short walk to the view, which is one of the best in the Southeast. You have to drive down a bumpy gravel road a ways, but the view is worth it. The high route at Grandfather strikes me as way to difficult to be popping the question on unless you’re beloved is a very experienced, dedicated hiker who likes extremely rugged trails. There’s also an excellent view on the rocks just beyond the swinging bridge that might be a nice romantic spot. If you do Grandfather, play hookie from work and go on a weekday; it’ll be much less crowded. We are headed to Grandfather this weekend. Are the ladders something straight up or angled? We have two avid hiking dogs with us but I am wondering if we need to stay off the trails with ladders. Beautiful site by the way! Depends on how sure-footed your dogs are, I guess. I have seen dogs at Calloway Peak but they may not have taken the ladder routes. Ladder’s aren’t perpendicular to the ground but they pretty steep. Just did this hike this week, and wow is all that can be uttered. Started at the top of GF Mtn, all the way to the profile trail down to 105. My GPS clocked it at approx 5.5 miles, but very unnerving at some points. Suggestion is to get an early start, as there are many really good picture opportunities and if you get going too late, you will have to hoof it to make the whole trek. The GF parking area closes at 6pm, and the Profile area closes at sunset. Make sure you fill out a permit and drop it in the box if starting from Profile. I would suggest the same thing if going from the top down. Avoids issues with the rangers. 11/18/2012 – Hiked from Boone Fork Parking Lot on the Blue Ridge Parkway to the mile high swinging bridge. 12 miles round trip. We started at 10 AM, and ended up walking two hours in the dark on the way home. Suggest starting at 7AM to do this hike. We took Tanawha Tr, to Daniel Boone Scout Tr, to Underwood/Grandfather Tr. There was one part on the grandfather trail on the way back that was nearly impassable. The cable descent just after McRae peak was completely iced over!!! To put this in perspective for people, it is a steep 100-200 foot rock face covered in ice, and at the bottom is a ladder down to the ground. It took us a good 45 minutes to move around this part using the trees. We would have appreciated a sign telling us the trail was closed due to ice.